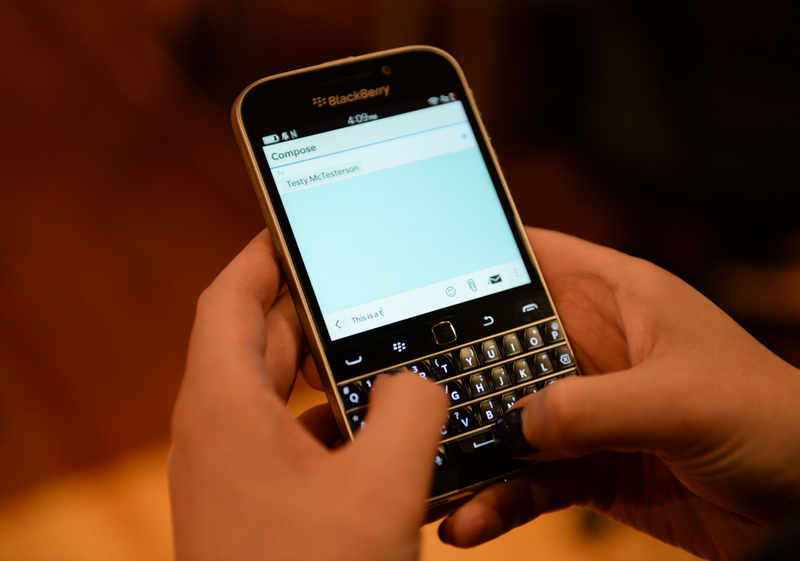 Few tech companies elicit as emotional a response to Canadians as BlackBerry. But the once-quintessential tech giant, stifled and contracted, has eaten crow for nearly two years, and is ready to begin a new phase as a software and services company. To that end, the release of the Passport in September and, today, the Classic, attempt to meet its dwindling customer base where it already is: the boardroom. The Classic, with its Bold-like aesthetic and reintroduced trackpad, goes right for those long-suffering loyalists, clinging to devices with cracked screens and keys akimbo. 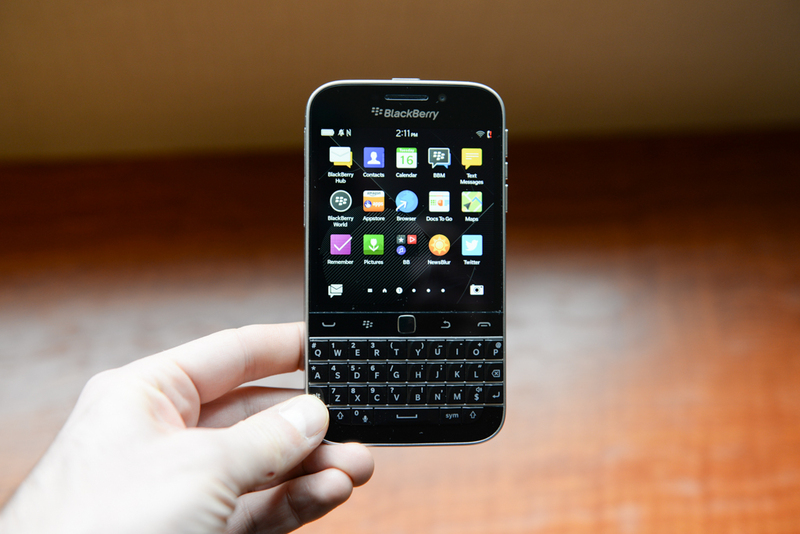 But can the Classic break out of its narrow bubble — and does BlackBerry even need it to? Let’s find out. 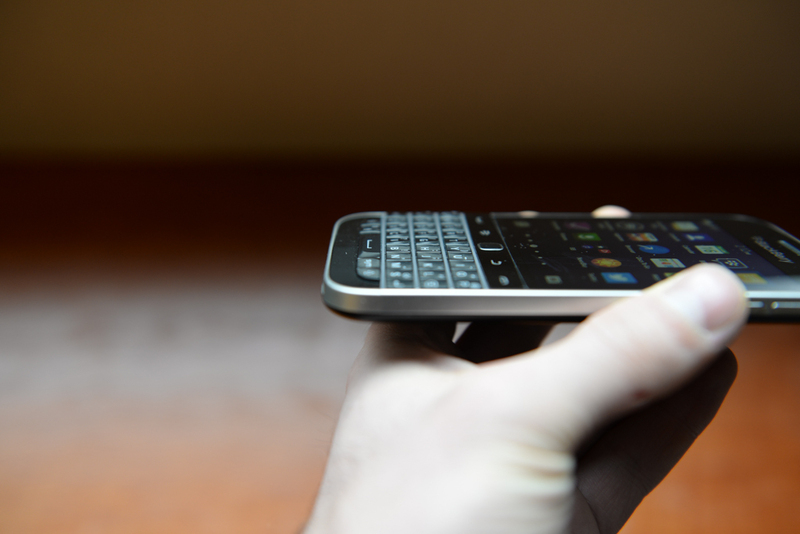 Few phones betray their creators’ intentions like the BlackBerry Bold. A once-storied brand that has since been reduced to vignetted images of Luddite executives unwilling to abandon the immediacy (and ever-fading light) of traditional email and SMS services, BlackBerry has attempted to reclaim some of that vitriol with the Classic in a way the now-aged Q10 never could. I admit to being immediately attracted to the Classic’s comfortable, fretted hardware keyboard but, like many now-obsolete technological trends, a hardware keyboard feels less essential than anachronistic. The past three years have seen innumerable improvements to touch accuracy, autocorrect algorithms and, to the benefit of consumers most, screen sizes. 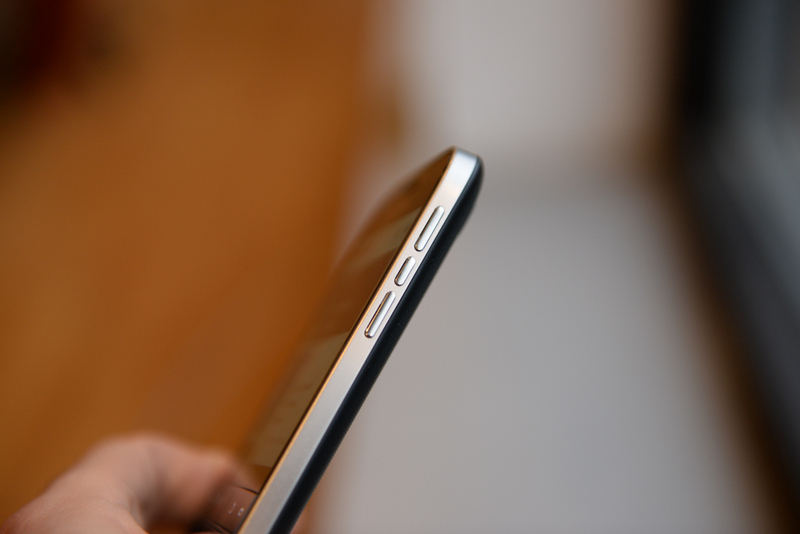 Turning the Classic over in one’s hand reveals a heft missing from many modern smartphones. It is a serious hunk of machine. Like most BlackBerrys it is framed by stainless steel, and though it lacks the subtle finesses of the flagship Passport, it’s incorrect to call the Classic a ‘discount’ or mid-range device. The front bears more than a passing resemblance to the device many loyalists have clung to for dear life, the Bold 9900. The screen is bigger, at 3.5-inches, and of unmistakably better quality — both higher resolution and comprised of new technology — but the Classic is, for better or worse, not an entirely new product. There are some important changes to note. Like the Passport there is no removable battery, which will likely irk the moribund masses of Crackberry addicts, but the 2515mAh battery is substantial enough to last a day and then some. This is no computational powerhouse, either: the internal specs are pure early 2013: a dual-core 1.5Ghz Snapdragon S4 chip (the same one found in the HTC One X and Samsung Galaxy S3, for context), 2GB of RAM, 16GB of storage and an 8MP camera. 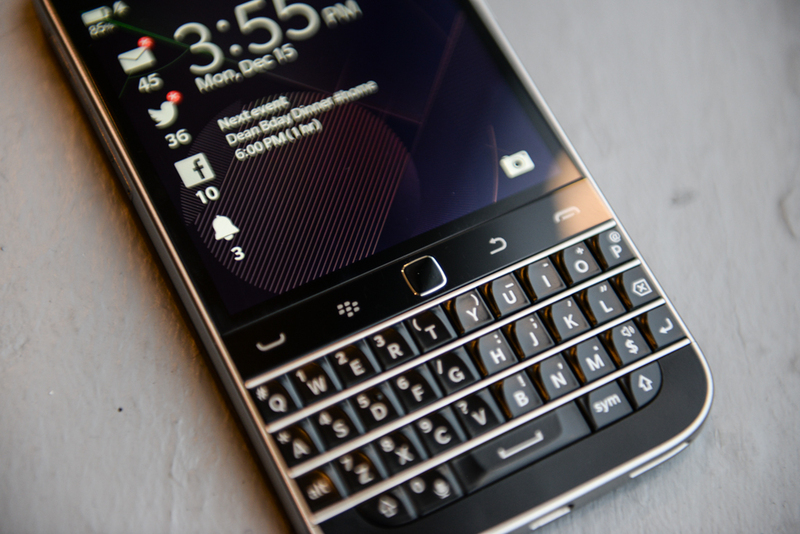 Remove the trackpad and four-button ‘tool belt’, axe half an inch from the screen and you have a Q10. So why does the Classic exist? All but the few die-hards waiting for this phone will, along with me, scratch their heads in puzzled bemusement, but I’ll admit, as someone who got his start in this field pushing out BBMs on a tiny BlackBerry Pearl, the Classic brings home the feels. Like its predecessors, the Classic is a bulky chunk of metal, a 10.2mm slab of smartphone weighing in at 178 grams. Compare it to the Q10, which was nearly 40 grams lighter, and you can tell right away this is a completely different class of device. Most of that extra weight comes from the larger battery — 2515mAh to the Q10’s 2100 — but the materials, including the steel frame and grippy back cover, add considerable heft. All the buttons you’re familiar with — power, volume, play/pause — are in the same spots you left them, and a change in manufacturer to Foxconn hasn’t sullied the exemplary build quality. Improved is the location of the charging port, relocated from the left perimeter to the bottom centre, where it should be. 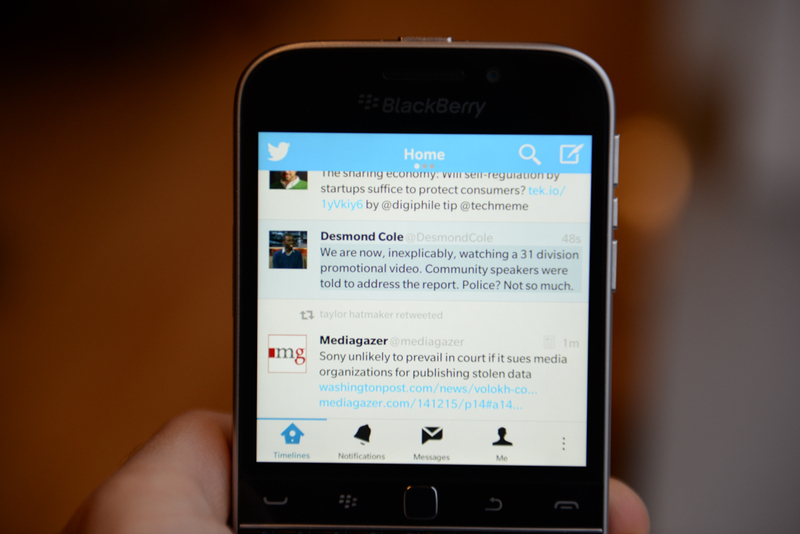 The screen, in particular, has been boosted in quality over the Q10. While the 3.5-inch IPS panel is marginally less dense, the technology behind it is far superior. We’re talking about improved viewing angles, more accurate colours and whites, and better touch response. LCD is also a better choice for BlackBerry 10.3’s lighter colour palette, something that hasn’t received a lot of attention since its release. And that ‘tool belt’ has returned, along with the trackpad John Chen insisted so many customers missed from the Q10. While I find it difficult to believe BlackBerry’s wolf cry about how customers claim they would have purchased the Q10 if BlackBerry 10 had been less reliant on gestures for navigation — BB10 is nothing if not intuitive — the Classic goes a long way to ensuring the upgrade path of those legacy BBOS users will remain squarely in the family. The buttons perform as predicted, which is to say the ‘Call’ button opens the dialer, the ‘Menu’ key activates an app’s context dialog, the ‘Back’ button returns to the previous screen, and the ‘End’ button ends a call or acts as a home button. To me, these additions feel backward and regressive, and stunt the growth of BlackBerry 10 as a platform, but to others they will be like dopamine-enriched mana from the smartphone gods. 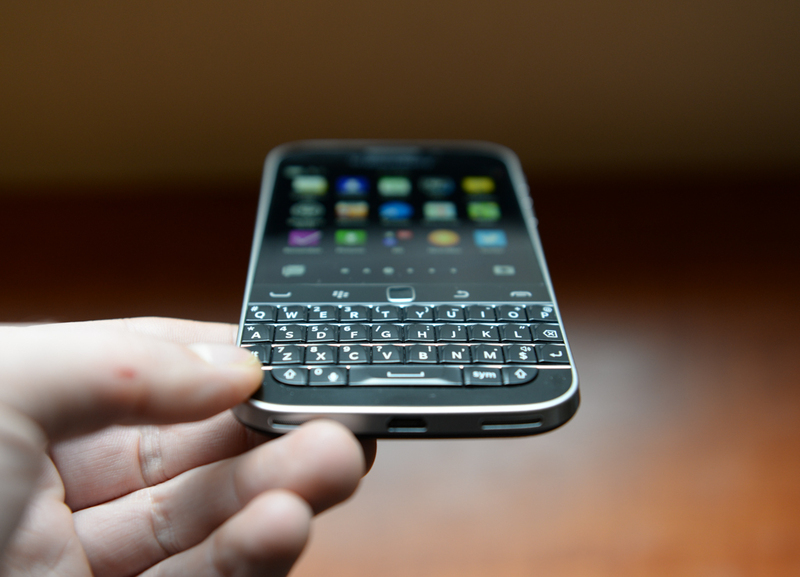 BlackBerry assumes that most Classic buyers will be upgrading from a legacy BBOS device. 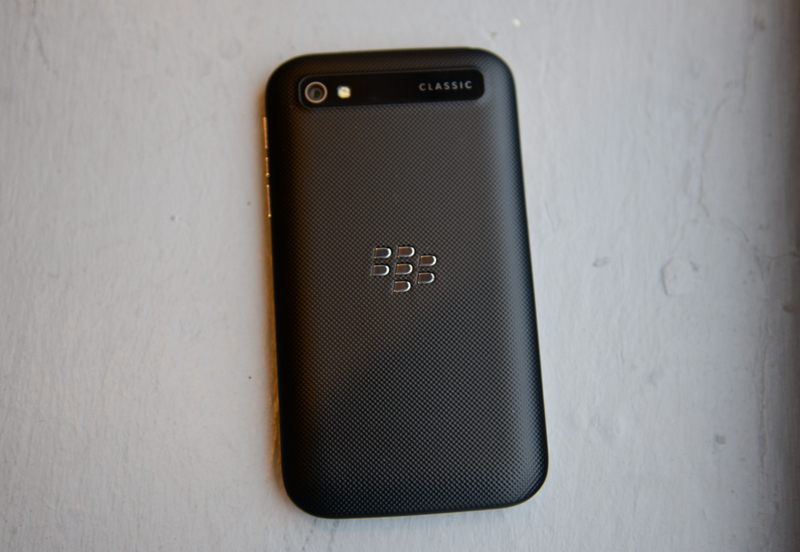 The Classic’s existence is partly meant to clear up the mess left from the transition from BlackBerry 6 and 7 to BB10, which was not only built on a completely separate underlying platform but did away with the legacy trackpad-menu button navigation scheme. Questionable learning curve aside, BlackBerry 10.3.1 adds trackpad support to an operating system that wasn’t built to manage it. In many ways it’s the opposite, but similarly senseless, stopgap measure BlackBerry used to tack on touch support to BlackBerry OS. While it’s possible to entirely rely on touch input (ostensibly recreating a Q10), navigating with the trackpad feels natural — to an extent. BlackBerry has done a commendable job creating ‘zones’ that the trackpad knows to acknowledge with a pleasant blue highlight. Unlike BB OS of past, there is no cursor (outside of the web browser and Maps app), so that blue highlight is all the visual assurance you’re going to get. I found a most effective a hybrid method of navigation, using a finger until I got to an article or email and then switching to the trackpad for casual vertical movement. Even as an experienced Bold user, I found the trackpad superfluous in all but a single use case: editing documents. This is where the precision of a “mouse” comes in handy, and BlackBerry users will quickly reacquaint themselves with the notion of highlighting text using ‘Shift’ key and then pressing the ‘Menu’ button to copy or paste. 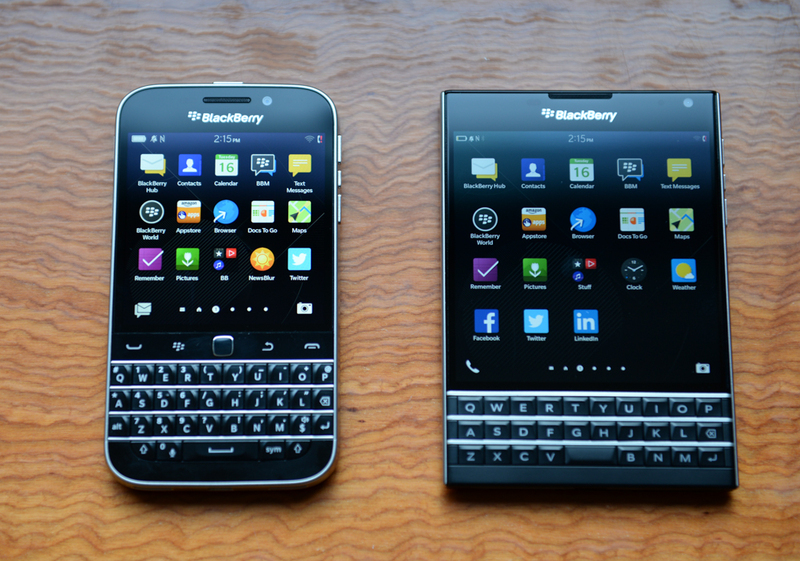 There is no question of BlackBerry 10’s excellence in communications consolidation. The Hub brings all your emails, texts, Facebook, WhatsApp or WeChat messages, Twitter replies and DMs, LinkedIn inquiries and Google Talk conversations into a single place, and after reintroducing my thumbs to the spritely genius of a hardware keyboard I was click-clicking out emails in no time. But when you look at the siloed nature of the Hub — only apps explicitly supported by BlackBerry show up in there — you realize how limiting it is. Sure, everyone receives emails, texts and Facebook messages, but what about companies that rely on Slack, Asana, Hipchat or any other closed system of communications? What about lovers of Line, Kik, Hangouts or Telegram? Unless they create a native Cascade-built version of their app that integrates with the Hub — and none of the above do — they’re out of luck. Some of these use cases can be augmented with Android apps, but the experience is subpar. BlackBerry makes it possible for developers to add code to Android apps so push notifications can be relayed through the BlackBerry Hub, but few, if any, apps have been updated to do so. As a result, I can use Slack, Line, Kik and Telegram on my Classic, but incoming messages are invisible until I open the app to check. This may be a first-class communications device, but only if you or your organization sticks to email or WhatsApp. The other issue that I still can’t quite wrap my head around is the Facebook/Twitter polling issue. With Facebook Messenger or Twitter on iOS or Android, responses come through as push notifications instantly. Because Facebook and Twitter for BlackBerry 10 are built upon the company’s APIs and not by their own dev teams, messages can sometimes take as long as 10 minutes to appear in the Hub. For a communications platform that prides itself on instant gratification, this is unacceptable. Then there are the ‘This post could not be loaded’ error, which would happen to random Facebook posts without warning. If BlackBerry wants to maintain the social media usability of its Hub it needs to sort out these issues. As I said in the Passport review (and the reason for such a low ‘Software’ rating), from an ecosystem perspective BlackBerry 10 feels incomplete. That it runs Android apps is a useful coverup for the fact that, to most developers, it is a dead platform, but those Android experiences, especially on the Classic, are often rife with input problems. I acknowledge that it is cute to see Monument Valley running on a BlackBerry, but when you begin rifling through the Amazon Appstore it becomes immediately apparent that it, too, lacks the quality app selection of the Google Play Store. Sideloading Android apps is as easy as downloading and opening an APK file from a web browser or cloud storage service like Dropbox, but then you miss out on the updates. You shouldn’t have to fight with your smartphone, and unless I go without the basic functionality I take for granted on iOS, Android and even, on occasion, Windows Phone, BlackBerry 10 commits the sin of being frustrating. 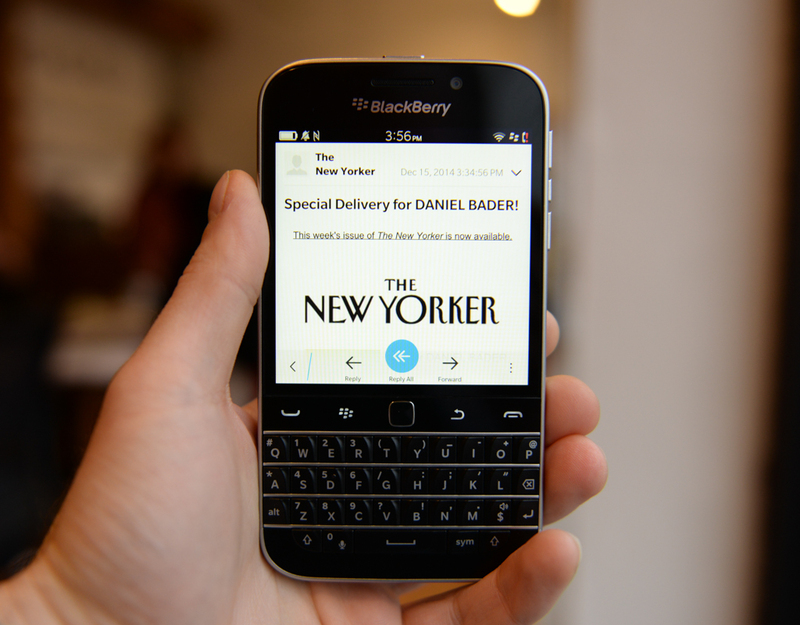 That the “classic” BlackBerry user continues to be defined by email largely reinforces the need for a product like the Classic. I still don’t love BlackBerry 10 — its holes are too numerous, and its purported advantages stilted by poor app support — but I understand the loyalty it inspires when I receive ten emails, nine BBMs, eight WhatsApps, seven Tweets, six Facebook messages, five LinkedIn invites and a partridge in a pear tree. It’s stupid-fast for that stuff, and if my smartphone needs were uncomplicated I could see myself being quite happy with a Classic. The company has also done a lot to improve access to common OS elements through gestures or quick toggles. For example, BlackBerry 10.3 introduced actionable notifications, so receiving a text message or BBM while in another app no longer means going back and forth between windows. Calendar invites can also be accepted, dismissed or snoozed from within a notification as well. Lock screen notifications have also enhanced the ‘glanceability’ of BlackBerry 10, and because they tap into the Hub it’s possible to see individual pieces of content from email accounts, texts, Twitter and others. 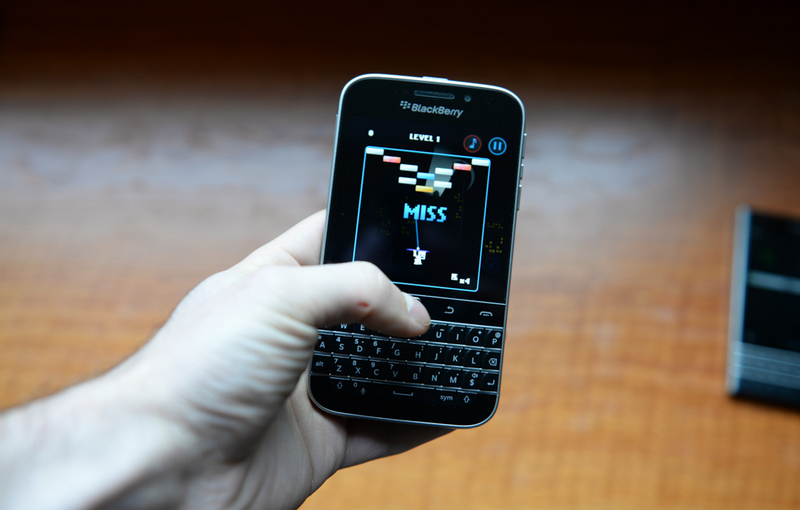 Aware of its fleeing developer community, BlackBerry has attempted to recreate third-party experiences within the core OS experience. Password Keeper is now pre-installed, allowing users to securely save and sync passwords, credit and loyalty cards, notes and other important information between devices. The app uses a BlackBerry account to perform the synchronization, so it’s not possible to share data with other platforms, but family members can share content between BlackBerry devices. BlackBerry has also substantially beefed up its Microsoft Office support with a new version of its in-house Docs To Go app, which can create Word and Excel and read Powerpoint presentations. The pre-installed native version of Evernote has also received a nice UI boost with BB10.3, but it lacks newer features, like document and business card capture, from its iOS and Android counterparts. Relying on Android apps to fill in the gaps, too, becomes a game of cat-and-mouse, since an increasing number of apps rely on Google Play Services to run, an element of the Android OS that isn’t available to BlackBerry 10 users. All Google-built apps and third-party software that relies on the Google Maps API will throw an error. 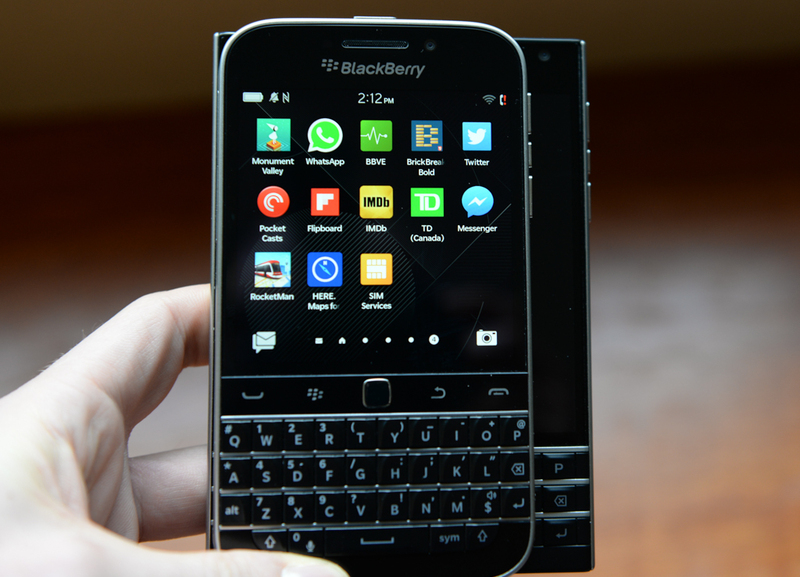 One area BlackBerry is excelling, perhaps beyond even Apple’s Siri, is with its Assistant. Available from the keyboard- or voice-activated universal search screen, Assistant can hook into search engines like Google or Bing, as well as Yelp, Foursquare, Wolfram Alpha and more to obtain results to a multitude of queries. I was rarely disappointed. And, of course, there’s BrickBreaker. 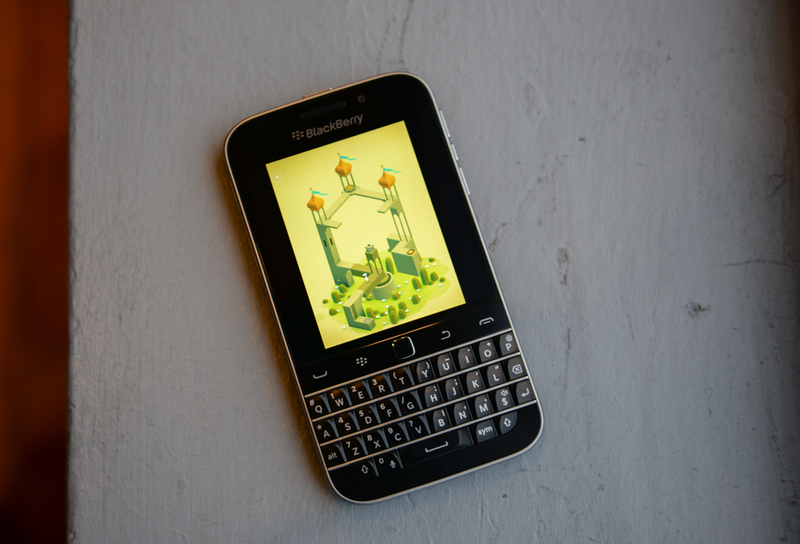 BlackBerry brought the seminal game back for the Classic’s trackpad-friendly release, in the form of a new title called BrickBreaker Bold (#throwback). As always, it’s simple, addictive fun, and it shows that the company still has a sense of humour despite its enterprising proclivities. Speaking of enterprise, BlackBerry 10 is not encrypted by default, a new measure taken by iOS 8 and Android 5 to improve security overall, but it can be enabled. For enterprise users the number of compatible MDM solutions — including the newly-released BES 12 — plus Balance and Blend make for a compelling argument, but BlackBerry no longer dominates the industry in this regard. Both Android and iOS have made huge strides, and have partnered with enterprise giants, to make inroads into the lucrative enterprise space. A quick note on performance: running a 1.5Ghz dual-core Krait chip does not seem to hamper the OS much. The Passport, with its 1440×1440 pixel screen, likely needed the beefier GPU in the Snapdragon 801 SoC but the Classic, jumping through apps or loading web pages, never felt constricted. BlackBerry’s improved WebKit browser, still the only means to access a vast amount of content given BlackBerry’s app gap, occasionally stumbles over itself when loading HTML5-heavy pages, but is otherwise performant and stable. 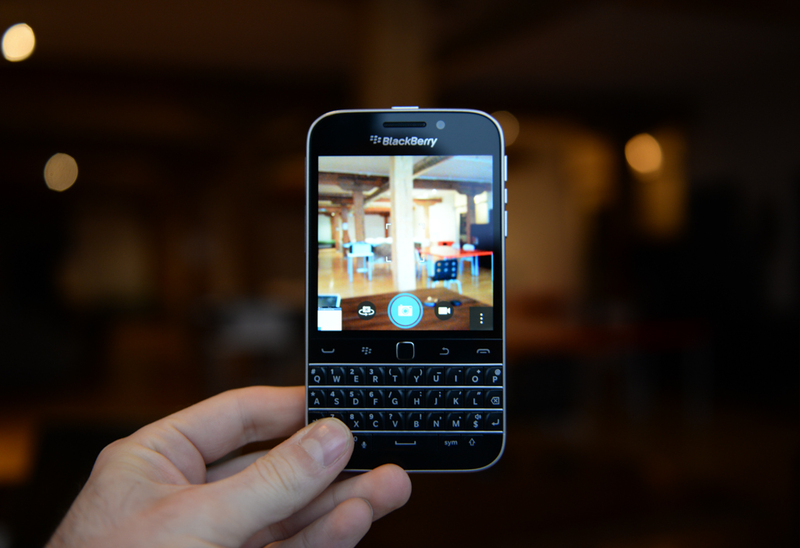 The BlackBerry Classic has an 8MP rear camera with an F2.2 lens that, combined, falls into the good-not-great category. The sensor appears to be identical or slightly improved over the one in the Z10 and Q10, with perfunctory detail capture and colour reproduction in good lighting. But, like most other phones with ⅓-inch+ sensors, it falls apart indoors. I’ve come to realize something about smartphone cameras: you can either rely on them or you can’t. The Classic falls into the former category, and despite middling low-light results I was generally happy with nearly every photo I took from the device. BlackBerry has done a good job improving its camera software in the last few iterations, no longer relying on a tap-anywhere-to-shoot paradigm that confused and frustrated for all the out-of-focus shots it took. The 4:3 sensor defaults to 1:1 in order to fill the whole screen, which is absurd if you think about it, but the new ‘Auto Suggest Mode’ feature detects the right scene — Time Shift, Burst, Panorama — and switches to it with little user input. The Classic can capture 1080p video at 30fps or 720p at 60fps, a limitation of its three year-old chipset. Quality was good, but the lack of image stabilization led to jerky, bumpy movements when walking or panning. 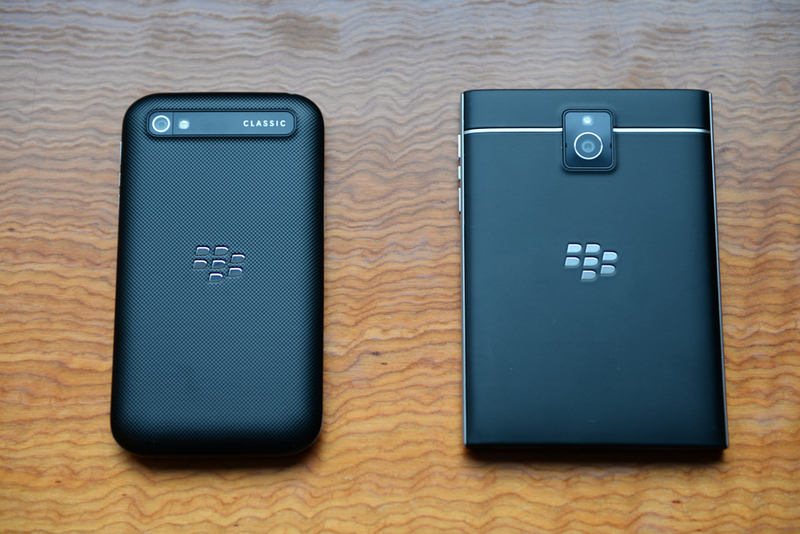 The Classic, like the Passport, represents BlackBerry well for the high-use customer contingent. The 2515mAh cell is not removable, but it’s well suited for all-day use. I used the Classic as my main phone for a week and never once went below 30% in the course of a day. That usually meant getting up at 7am and going to sleep at or before midnight. The low-power CPU coupled with software optimizations make for a pretty tireless smartphone companion. The Classic doesn’t get quite as loud as the Passport, but its single rear-facing speaker is perfectly capable of delivering a hit of music or guiding a conference call. Headpiece quality is just as good, and holding the relatively diminutive phone, despite its heft, is not cumbersome. 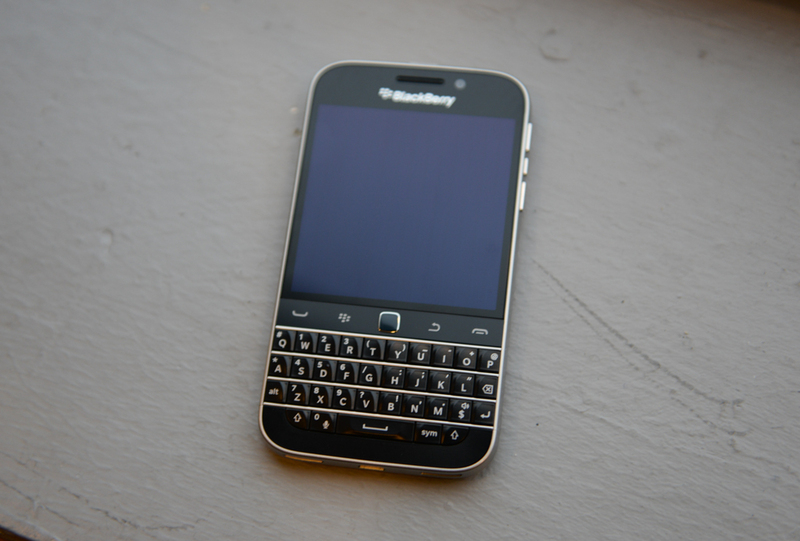 The unlocked BlackBerry Classic can connect to every LTE networks in Canada, including Rogers’ and Bell’s 2600Mhz offering. It also supports 700Mhz connections. It’s not LTE Advanced-capable, but with speeds up to 75Mbps I was happy with the device’s cellular performance. The version sold on ShopBlackBerry also supports Band 4 (AWS) on HSPA+, which means it will work with WIND Mobile, Videotron, Eastlink and Mobilicity out of the box. The Classic is a beautiful, nostalgic mess. It’s a good phone with ample battery life to take on the day, and a familiar-feeling hardware keyboard for those who can’t go without. While I understand the device is, by virtue of its name, a concession to long-suffering BlackBerry loyalists, the company’s inconsistent implementation of hybrid trackpad/touch support makes for a frustrating experience. Lovers of the Bold’s ‘tool belt’ will still need to learn a brand new operating system, and maneuver the compromises therein. If the Passport is the thoroughbred, powerful and unpredictable, the Classic is the reliable donkey, unwavering and loyal. Software-wise there’s a lot to like, and BlackBerry has modernized BlackBerry 10 as much as it can, but the lack of third-party apps palls, even with rudimentary Android support. For those who want email, messaging and basic smartphone functionality, the Classic brings the Bold series up to modern standards. For everyone else it is, as BlackBerry itself admits, ‘probably not for you’. SyrupCast Podcast Ep. 163: Facebook, why can’t I quit you?